Brenda Sayers, Hupacasath First Nation corespondent addressing the Canada-China FIPA trade deal with several labour and community organization representative supporters. 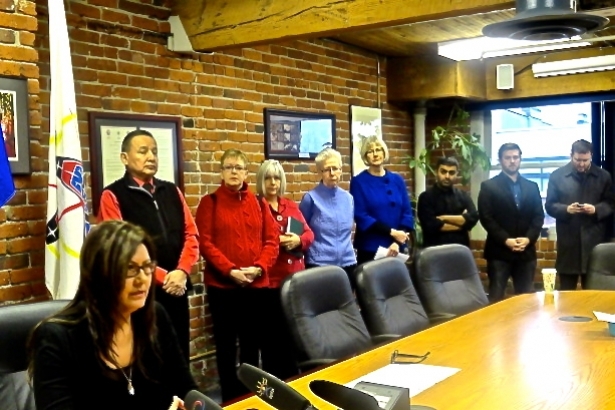 A diverse alliance of groups including unions, environmental and citizen advocacy organizations added their voices to a press conference hosted by the Hupacasath BC First Nations, to speak out against the Harper government’s proposed Canada-China Foreign Investment Protection Agreement (FIPA). Hupacasath First Nation Councillor Brenda Sayers told the Vancouver Observer that the Hupacasath are “hopeful that [Stephen Harper] will live up to his responsibilities to First Nations, and consult” before going forward with the FIPA deal. 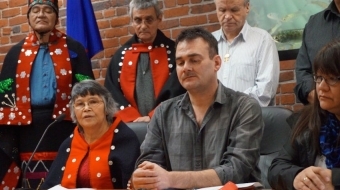 On Friday, the Hupacasath filed affidavits for what they believe are violations of preexisting aboriginal rights to resources. She said he Hupacasath BC First Nations “have a lot of support from other First Nations”, such as the Chiefs of Ontario—who have also filed an affidavit against FIPA—as well as the Tsawwassen First Nations. A host of concerns were stressed at the conference, environmental interests, employment security, treaty resource rights, and the lack of democratic debate and transparency around the agreement. One major concern is that the China-Canada FIPA agreement will permit Chinese businesses to sue Canada for any legislation considered unfavorable towards their business interests. For example, if the controversial Enbridge Northern Gateway pipeline were to be rejected, Chinese oil companies can take legal action against Canada. What's more, Sayers asserts that Canadians will likely end up footing the legal bill if such a case happens. According to Grand-Chief Stewart Phillip, president of the Union of BC Indian Chiefs, the China-Canada FIPA deal represents a serious threat to the interests of First Nations. “One of the most fundamental laws of common law in terms of commerce is, you cannot buy sell or barter what you do not own”, he commented — a direct reference to First Nation’s rights and title to their unceded territory in BC. Phillip then went on to criticize the “insidious” deal for its perceived lack of transparency, claiming that the “Harper government had every intention of sneaking this through Parliament without any debate whatsoever”. Environmental advocates asserted that the secrecy surrounding the deal is linked to Canadian projects to export more oil to Asia. ForestEthics campaigner Ben West raised another contentious issue, linking the FIPA agreement to BC’s bid for oil sand pipelines. 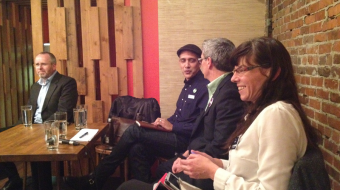 “As an environmentalist, it’s hard not to look at what’s going on with FIPA right now and not see the names Kinder Morgan and Enbridge written all over it” he said. 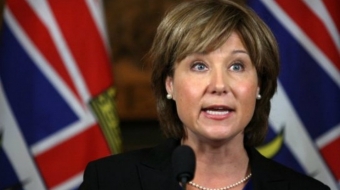 In the context of recent disputes over pipeline projects in BC, West believes that FIPA represents an attempt to help facilitate extraction of oil resources, if the Enbridge and Kinder Morgan pipelines are realized. Rudy Husny, Press Secretary for parliament, responded to FIPA concerns in an email to The Vancouver Observer. “It is Canada’s long-standing policy to permit public access to investor-state dispute proceedings. Canada’s Foreign Investment Promotion and Protection Agreement with China is no different,” he wrote. He did not comment on the Hupacasath press conference or claims that First Nations were not adequately consulted on the agreement.